Orange Tree’s one bedroom condo vacation rentals are nicely furnished, having been recently redone in southwestern tones. 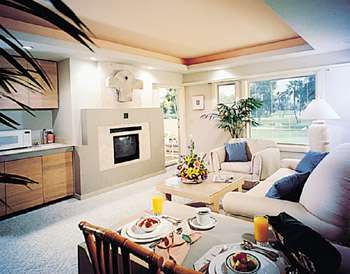 Large living and sleeping areas are complemented with luxurious amenities. Each 740 square foot suite is beautifully accented with French doors that open onto a private terrace and breathtaking views of the desert paradise. We no longer own at this resort, so please consider our offerings at Worldmark Phoenix South Mountain Resort (see side menu). Not seeing what you want? Then, try a search with The Vacationator to find your perfect condo vacation rental here or anywhere in the USA. The Orange Tree Golf Resort is a contemporary Southwest vacation destination encompassing 128 scenic acres. Serene and intimate, the Scottsdale golf resort offers a collection of finely appointed guest suites with such features as private terraces, complimentary wireless Internet access, kitchenettes and two-person Jacuzzi tubs. The Orange Tree Golf Resort in Scottsdale pleasantly combines the personalized service of a country club with top-rated amenities of a fine resort. In addition to a carefully maintained 18-hole USGA-rated golf course, Orange Tree Golf Resort offers a fully-equipped golf pro shop, an outdoor pool with seasonal poolside bar, concierge services and an exceptional location. With the backdrop of the striking Sonoran desert, the resort is situated within close proximity of such activities as river rafting and hot air ballooning, as well as the breathtaking Grand Canyon. We are the center for many sports teams – including the Arizona Diamondbacks Baseball Phoenix Coyotes NHL Hockey Phoenix Suns NBA Basketball Spring Training Baseball and theCactus League. Photos courtesy of Timeshare Users Group.